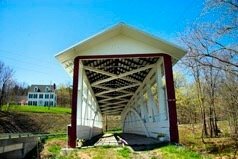 April of 2006 I decided to travel to Bedford County in Pennsylvania and photograph their 14 covered bridges. When setting off on an excursion like this you never know what you are going to encounter. I had read some articles on the bridges, but I usually don't take the authors word as law. My wife and I went with open minds as to what we would find. This would be county twenty, and we have had our expectations of the bridges burned out from under us before. 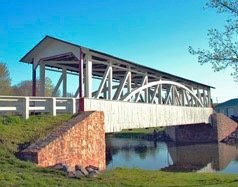 Well, not this time, and on with the story...May I say, Bedford County has some of the most beautiful and best maintained bridges in the state and they should be proud as to what they have done to preserve the beautiful heritage of these magnificent structures. And as long as I am giving out the compliments, I will add that I researched the net before embarking to Bedford. I chose to stay at a Mom and Pops motel by the name of Judy's...All I have to say is the people in this motel and the surrounding area were what we call down home folks and a pleasure to visit and associate with. I did manage to get photos of 12 out of the 14 bridges, this was because the bridge that enters Old Bedford Village (Claycomb) was completely torn down except for the Burr trusses.. They are refurbishing the bridge, it should be reopened by the opening of the summer tourist season of 2006. We also decided not to make the long trip to Palo Alto bridge in the south western part of the county. I am going to wait until Claycomb is finished and I will get both at that time. The following year I returned to Bedford County after photographing the bridges in Somerset County and photographed the two remaining bridges I had missed. 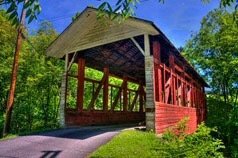 Believe me when I say, anyone that enjoys covered bridges and the splendor of them will not regret seeing the beautiful bridges of Bedford County. 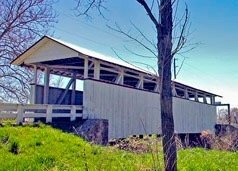 This structure was built in 1890 and crosses Bob's Creek, the length of the bridge is 90 ft. and the width is 12 ft. 4" utilizing the burr truss. The builder of the bridge is unknown and the owner is Bedford County. The bridge can be found by Route 575, just west of of State Route 869, approximately 1.3 miles northwest of Osterburg in E. St. Clair Twp. This bridge only allows foot traffic, there is a modern bridge alongside this structure. The bridge is in very good shape and well maintained. It sits in a beautiful open setting of rolling hills and farm land. This is a must to see bridge another jewel of Bedford County. Claycomb/Reynoldsdale Bridge had been recently reconstructed in 2006 and has a weight limit of 28 tons, this is not common for covered bridges. 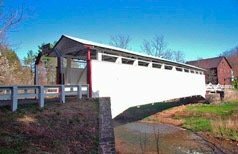 The bridge is located at the entrance of Old Bedford village, being a tourist attraction it has quite a lot of bus traffic that goes across the bridge, this would account for the heavy tonnage on the structure. This bridge was originally built in 1880 at Reynoldsdale approximately fifteen miles north of its present location. The bridge was moved to its new location in 1975. This structure utilizes the Burr Truss and crosses Raystown Branch, Juniata River. The length of the bridge is 126 feet and the width is 13 ft. 10 in., it is open to all traffic and is in excellent condition. 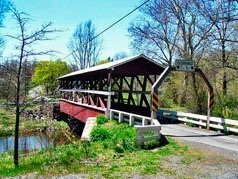 The location of the bridge is just west of State Route 220 at the entrance of Old Bedford Village, approximately 1.8 miles north of Bedford, Pennsylvania. 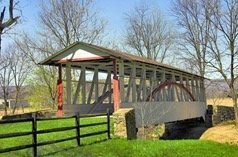 The bridge was built in 1880 using the Multiple kingpost design, the structure crosses Shawnee Creek in Napier Twp. The builder is unknown and the county owns and maintains the bridge. The bridge is located on Township Route 443, approximately 1 mile southwest of Shelisburg in Napier Twp. The bridge is open to traffic and in excellent condition. 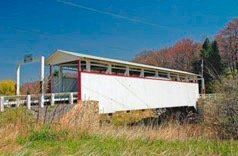 This is one of the very few bridges in Bedford county that utilizes the red barn paint as the other bridges are painted white with a red trim. Again the bridge does sit a a beautiful setting and is a pleasure to photograph. Location of the structure is on the east side of State Route 96 where it has been bypassed, approximately 1 mile north of New Paris in Napier Twp. Dr. Knisley bridge was built in 1867 and the builder is unknown and is privately owned. The structure construction utilizes the Burr truss its length is 80ft and width 12 ft. The bridge is only open to foot traffic and it crosses Dunnings Creek. The location of the bridge is just north of State Route 4013, a short distance southwest of State Route 56, approximately 1.4 miles southeast of Pleasantville in West St. Clair Twp. This bridge is in beautiful condition and the setting surrounding the bridge really does it justice. The bridge is well maintained and one of the nicest in Bedford county. It is a bridge that is nice to photograph no matter the season. Although the bridge is blocked off from any traffic and privately owned there are no "No Trespassing" signs visible on or around the bridge. This is another one of my favorite sites to see in Bedford county.. The bridge was built in 1892 using the Burr truss, its length is 105 ft. and width 12 ft. 6 in. The Builder was W.S. Mullins and is privately owned. The bridge crosses Brush Creek and is only open to foot traffic. The location is off State Route 2029 approximately 1.5 miles west of Jackson Mills in East Providence Twp. I can say this is one of the most heart breaking sites of covered bridges I have seen in my travels. The bridge is hard to get access to because of the over growth of trees, weeds. The bridge is in bad need of repair, I really don’t know how stable this bridge is, but without the county and states help I am afraid it is doomed. I wish the county and land owner could come to some agreeent for the refurbishing of this fine structure. As you can see by the photo it is close to impossible to get a good photograph of the bridge. Fischtner Bridge was built 1880 by Jacob or Johnathon Fischtner this bridge is quite separated from the other Bedford County bridges in a remote corner of the county. The bridge was constructed using the Multiple kingpost truss, it crosses Gladdens Run in Londonderry Township. The bridge is 56 ft. long and 13 ft. wide. This bridge is privately owned and in fair condition, it does allow vehicle traffic, but I do believe there are no trespassing signs. The bridge was built in 1872 and the builder is unknown, the owner of this structure is the county. The length of the bridge is91 ft. and the width is 12 ft. 6 in. this bridge was built using the Burr truss and it crosses Yellow Creek, it is open to traffic. Location is on Twp. Rt. 528 St. Paul's Church Road, just east of State Rt. 1022, approximately 1 mile southeast of Yellow Creek in Hopewell Twp. This bridge looks like it has just been recently refurbished, everything looks in mint condition. The bridge sits in a beautiful setting of farm fields and mountains. The structure rates an A+ in scenic beauty and the county rates the same on the maintenance and up keep of the bridge. This historical site is well worth visiting. 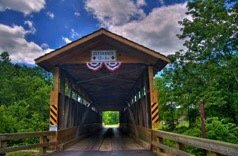 The Heirline Covered Bridge was built in 1902 and the builder is unknown, it crosses Juniata River. The length of the bridge is 138 ft and the width is 8 ft. 10 inches, it utilizes the Burr truss construction. This structure is owned and maintained by the state. The bridge is opened to all traffic and is in excellent condition, the structure had been refurbished recently. The bridge can be located on State Route 4005, Harrison Twp, where it meets State Route 4007, Napier Twp., approximately 0.5 mile northwest of Route 31, about 1 mile north of Manns Choice,Pennsylvania between Harrison and Napier Twp. 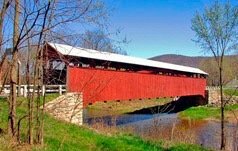 This is one of three bridges that is painted the typical covered bridge color of red. The setting of the bridge is very beautiful, at the entrance it looks like you are running into the mountain on the other side. This is a great site to photograph no matter where you position yourself. 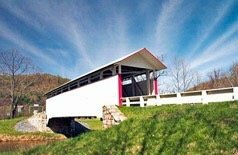 A must see covered bridge and a very well done to the owners, Pennsylvania. The bridge was built in 1880 and the builder is unknown, it crosses Twin Creek. The length is 88 ft. and the width is 13 ft. the owner is the county of Bedford. The construction uses the Burr truss, the bridge is in excellent condition and open to all traffic. Location of the bridge is on Twp Route 305, just east of Twp Route 306 approximately 0.4 mile south of the junction with the State Route 326 in Hewitt, Southampton Twp. This bridge is in a very remote area of the county with mountains and farms fields all around, the setting is beautiful. In and around the structure it is very well maintained by the county, it was a pleasure to photograph such a grand historical site. 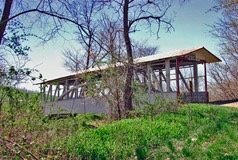 This bridge was built in 1875 utilizing the Burr truss, it crosses Brush Creek. The length of the bridge is 91 ft. and the width is 15 ft. The structure is owned by the county and was built by A.D. Bottomfield and Joe Pee. The location of the bridge is just off Twp. Route 412, approximately 1 mile south of State Route 2029, about 2 miles south of Breezewood in E. Providence Twp. The bridge was named after M.J. Jackson who owned and operated the gristmill and sawmill which is located close by. This bridge is open to all traffic it had been refurbished in 1991 at a cost of $489,000 which was much lower than the cost of a contemporary structure at the price of $850,000. The bridge has a very unusual uncovered bridge portion that extends from the roadbed to the east of the bridge. This unusual look has led to the nickname "The Grasshopper Bridge". The surrounding area around the bridge is nicely manicured and adds to the beauty of the surrounding area, the county does a very good job on the upkeep of this historical site. This bridge was built in 1892 and uses the Burr truss. The length of the bridge is 89 ft. with a width of 12 ft. 10 in. The structure crosses the Raystown Branch of the Juniata river in Harrison Twp. The builder is unknown and the owner of the bridge is Bedford county. This bridge carries vehicle traffic like most of the Bedford county bridges. The location of the bridge is on Twp. Route 418, approximately 0.4 mile north of State Route 31, midway between New Buena Vista and Manns Choice in Harrison Twp. This bridge is in good condition and is well maintained by Bedford County. The bridge was built in 1868 with a Burr truss construction. Its length is 84 ft. and the width is 12 ft. and crosses Dunnings Creek. The builder is unknown and the owner is Bedford County. The condition of the bridge is excellent and opened to all traffic. The location of the bridge is on Twp Route 599, just west of State Route 4013, approximately 0.4 mile east of Ryot in Clair Twp. The setting of the bridge in in open farm land with mountain background, a beautiful photograph can be accomplished in these surroundings. 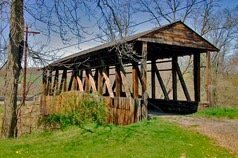 This bridge was built in 1880 using the Burr truss, the builder was unknown. The bridges length is 82 ft. and the width is 16 ft., It crosses Dunnings Creek in East St. Clair Twp. The bridge is owned and maintained by the County of Bedford. The location of the bridge is on Twp. Rt. 578 where it meets Twp Rte. 508, approximately 1 mile north of Spring Meadow in East St. Clair Twp. The bridge is open to all traffic and in excellent condition. Anyone wanting to photograph this bridge can have some fun with its surroundings, long white fences, farm land and mountains.